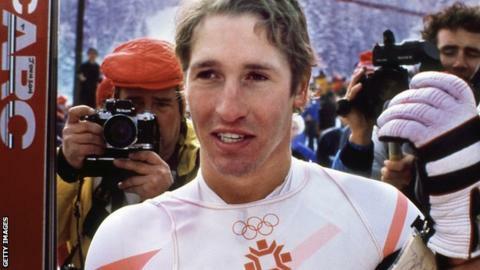 Bill Johnson, the first American man to win an Olympic gold medal in alpine skiing, has died at the age of 55 after a long illness. Johnson won the men's downhill event at the 1984 Winter Games in Sarajevo. An attempted comeback at the age of 40 ended when he suffered a traumatic brain injury when he crashed during a training run in March 2001. Johnson had been living in a care home in Gresham, Oregon, since suffering a major stroke in 2010. The Los Angeles-born skier, who grew up in Oregon, came to prominence when he became the first male American skier to win a World Cup downhill race, in Wengen, Switzerland in January 1984, before predicting he would follow it up with an Olympic gold - which he did. However, he subsequently fell out with US skiing officials. He had financial support withdrawn after turning up three days late for a training camp in 1985, and was suspended in 1988 for disciplinary reasons, failing to make the Winter Olympics team that year. His attempt at a comeback in time for the 2002 Games in Salt Lake City ended with a crash at Montana's Big Mountain resort. He barely survived, suffering critical injuries, and spent three weeks in a coma.